With Glittering Eyes: Go to the top of your Eiffel Tower. Go to the top of your Eiffel Tower. 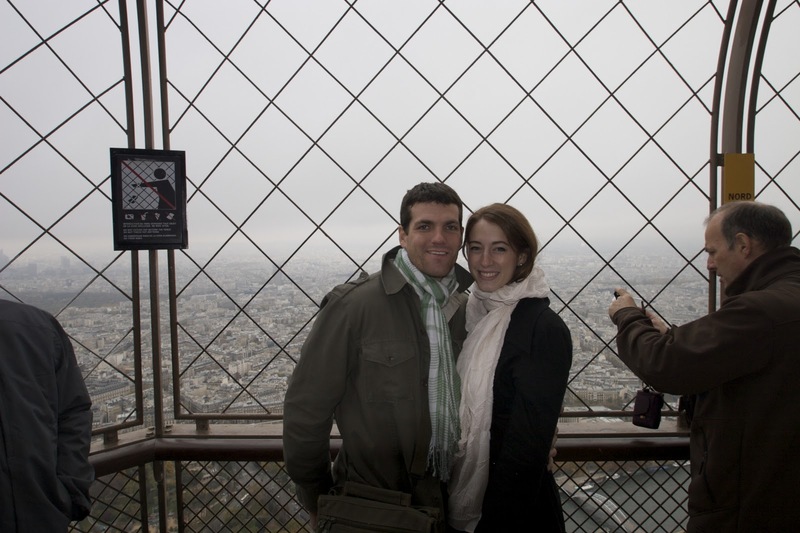 A few weeks ago, my husband and I stood at the very top of the Eiffel Tower. It was a really special moment to share with him, one that I know I will cherish forever. Interestingly enough, it wasn't my first time on the Eiffel Tower. A few weeks after I graduated from high school, I took a trip with a few other French students to see the sights in Italy and France. Unfortunately, the night that we made it to the Eiffel Tower, something happened with our scheduling and we couldn't go to the very top. We had a dinner reservation that we had to make and, much to the dismay of the entire group, we left the Tower having never made it to the top. Seriously, we were all pretty bummed about that. But our tour guide, Sophie, reassured us by saying, "It's ok everyone, you will all come back some day and when you do, you can go to the top then." My 18 year old self thought, "Well that certainly wasn't the point of the trip... to half see things and make plans to come back." But being a part of a tour group has its disadvantages... not being able to do everything you want to do is one of them. Two days ago, a young woman that went on that trip with me also passed away. She was nannying and something happened (I haven't heard what, yet, though they suspect a brain aneurism? As far as I know that is speculation) and just like that she is gone. One of the brightest, happiest, joyful, God loving young women I know. Gone. and I know everyone says the nicest things about people who have passed away, but I really mean this about her. She was so joyful. She had found Jesus in the last couple of years and literally oozed His love and goodness out of her pores. I'm serious. and, she didn't get to go to the top of the Eiffel Tower. and she really, really wanted to. I didn't see her often, but when I did, we would talk about how my sister, Lindsay, is an au pere in Paris and I gave her the websites Lindsay went to and she dreamed with me about what it would be like to live there. and the fact that she didn't get to do those things makes me terribly, awfully sad as I write this. So, dear reader, whoever you are. Please go to the top of your Eiffel Tower, whatever that may be. I don't know what it is for you, but I'm sure you do. and if someone says "no" or "maybe next time" or "that's for later in life" then I say, push them and their good intentions and expectations out of the way and run as fast as you can to the stairs and capture for yourself every moment that you want to live. and when you get there, take a deep breath and enjoy every second of being at the top. Enjoying my time at the top! I agree. I have been to the top og the Eifel Tower :o) But there are many things that I tend to put off 'til later. have you ever thought about writing a book? you should.